Crowdfunding and crowdsourcing… two terms that are closely related but not the same and can be easily confused. This article is to help understand what each term means and how it is different from the other. So let us talk about the Crowdfunding first. In easy words, crowdfunding is collection of source in the form of money. It can be for any purpose like raising a charity, or promoting a business or any project you want to begin. You can get crowdfunidng by collecting small amount of money through a large number of individuals so when it sums up it gives you a bigger amount to begin with your purpose. Crowdfunding can be donation-based, reward-based, lending or equity based. For example, if you are looking to build a football court in your community, you can ask your friends and neighbors and the community members to make small donations. Or you can collect money by making someone a photo album for their wedding on low cost to promote your work. At present it is mostly done via internet through various websites particularly developed for this purpose. Some common platforms for crowdfunding are Facebook, Kickstarter, GoFundMe, Indiegogo etc. On the other hand, crowdsourcing is also a collection of source just like crowdfunding, however, it is not limited to money only. Crowdsourcing can be done for collecting any information, manpower, workers for a large project that cannot be completed by an individual. For instance, you are looking to start up an advertisement company for a shampoo. You will need to look for people with different abilities to come up with innovative ideas, making videos, photographers and models. Basically, crowdsourcing is gathering or hiring a number of people to distribute the small tasks among them in order to accomplish bigger business goals in a very cost effective way. Or take an example of a software house. In order to carry out all the tasks efficiently a software house will need to divide the tasks of web developing, graphic designing, content developing, App developing to different people. 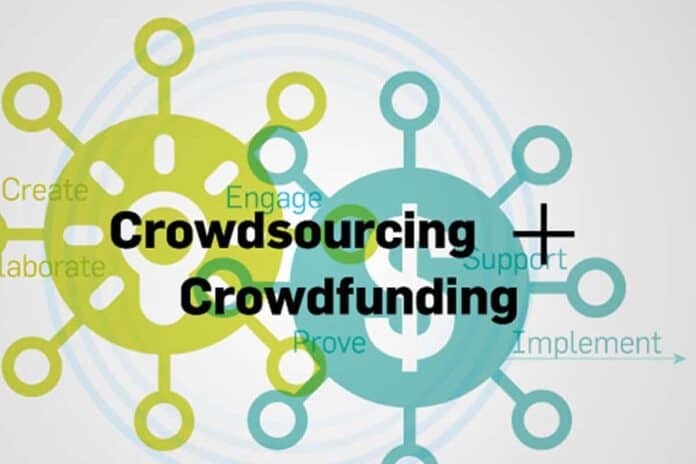 Now form the above description of both terms, it can be said that crowdfunding is eventually a type of crowdsourcing. Both are innovative and modern methods for building business and connections. Although both terms have many similarities, yet they are different from each other in many ways. Crowdfunding is for capital only, whereas crowdsourcing has no limits. With collaboration of both, number of entrepreneurs, researchers, artists, humanitarians and individuals are benefiting from the collaboration of multiple sources. Since, crowdfunding and crowdsourcing has been made easy through internet, organizations and individuals are gaining power and strength on the road of success.